The Scoop: The Network Advertising Initiative (NAI) is a coalition of over 100 companies — including the likes of Adobe, Google, and Rocketfuel — that are making data collection for digital advertising more responsible by being transparent with consumers about how it is collected and used. 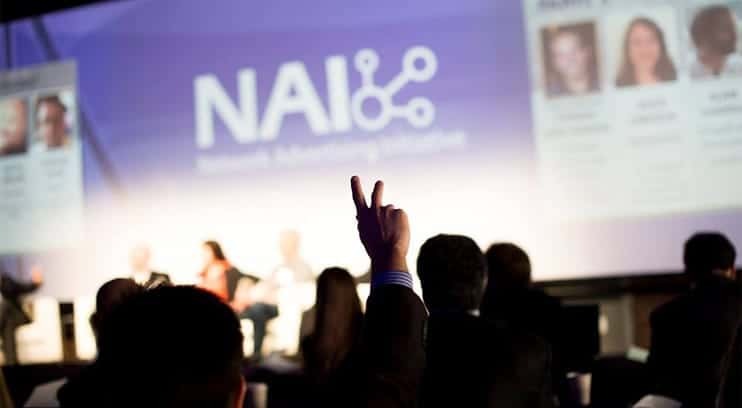 With a member code of conduct that constantly evolves to keep up with current digital trends, the NAI is always focused on the advertising technologies of the future — tablets, phones, and even smart TVs. Its commitment to consumer education is aimed at striking the perfect balance of advertising that maintains a free and robust internet. Recently, a friend of mine went through a breakup and decided she wanted to give online dating a try. She wanted to get the best bang for her buck, so she compared the prices and features of many different dating sites. After a while, she took a break to browse a recipe website for something delicious to cook that night. That’s where she found the best deal on a dating site: in an advertisement on the recipe site. The price was lower than she had seen anywhere else, so she clicked on the ad, went to the website, and purchased a membership immediately. She thought finding the ad was serendipity, but I told her it wasn’t just blind luck. That ad was meant just for her. When you browse online and then see an ad for that topic pop up on another website, it’s called Interest-Based Advertising. When you later see that topic show up in an ad on your mobile device, that’s called Cross-App-Advertising. You’ve probably seen both of these types of ads, and the Network Advertising Initiative (NAI) is trying to make sure you know as much about them as possible. NAI President and CEO Leigh Freund works to make digital advertising as transparent as possible. Advertising is paramount to for any industry, and interest-based advertising — or targeted ads — are the most effective way for companies to show consumers a product that appeals to them. Showing someone an ad for a free trial on a dating site when they’re browsing for shoes wouldn’t be very effective for the consumer or the advertiser. Many consumers don’t understand exactly how the ads are generated, but the NAI is working to take the mystery out of digital advertising and data collection. The NAI is a group of over 100 members — companies from Google to Rocketfuel — that have joined forces to make data collection more responsible and transparent to consumers. NAI President & CEO Leigh Freund gave us more insight into the organization’s values when we spoke with her recently. The companies all undergo a rigorous vetting process before they are granted membership, as the NAI wants to make sure the partnership will be good for consumers, too. After all, the goal is to open a dialogue between advertisers and consumers that can be beneficial to both. That conversation can be the first step in allowing everyone with a stake in the free internet to be on the same page. The internet has become such a part of our daily lives that the government regulates it like a utility, but a delicate balance still exists between advertising and unrestricted access to the internet. Currently, the price of a free and robust internet is seeing ads on web pages. Without that ad revenue, many websites would not be profitable, leading some of them shut down. That scenario would leave larger sites — most likely with paywalls — as the rulers of the web. To avoid that, the NAI is creating a partnership between consumers and advertisers that can help the free internet thrive. “We try to find a balance so that a company can have a legitimate business model and help provide free internet content that is supported by ad revenue, as long a company provides transparency and the opportunity for consumers to express their choice,” Leigh said. 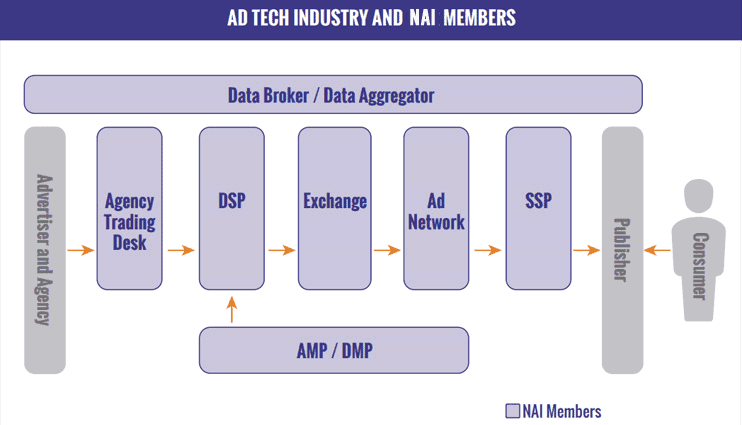 NAI members play a huge role in digital advertising. That’s why NAI members adhere to a code of responsible data collection. The code is constantly being updated as technologies and advertising evolve. The code is also a promise to consumers that the companies are committed to transparency and choice. NAI members know consumer collaboration is the best way to move forward, and they want to build that trust. Imagine your favorite website as the intersection of two major streets in your city. You’re sitting in your car at a stoplight at that intersection, and you start looking around. Third-party advertisers are like the billboards at that intersection, but instead of being static and displaying one image, they’re dynamic and can change content based on the interests of whoever is looking at them. That’s how advertising currently works online. The question many consumers have is: How do advertisers know consumer interests? The businesses that make up the NAI felt it had a responsibility to be transparent in explaining the process. The NAI has a membership summit every year where companies get together to talk about issues and changes in policy. The principles of Interest-Based Advertising are laid out in great detail on NAI’s website, but at its most basic level, it’s the reason you see ads that are relevant to you. To show you ads that you might be interested in, third-party companies use the information you generate while on the web. Not personal details like your name or Social Security number, but rather the kinds of searches you perform and the sites you visit. The data then paints a picture of you as a consumer. Rather than knowing a person’s phone number, an advertiser would rather know whether a person is interested in buying a bicycle. That way, it can show the consumer advertisements for bicycle parts, which would be more relatable. One way that the NAI proves its commitment to consumers is by putting a prominent opt-out link on its front page. This allows consumers to easily opt out of having their data collected, but the link also allows them to be more informed of exactly what is collected. All NAI members have opt-outs on their own websites, too, as required by the organization’s code. A visitor to the site can opt-out of interest-based advertising from any of NAI’s member companies easily, and the NAI is always looking for better ways to protect the consumer. The new non-cookie opt-out tool being developed is evidence of that. A cookie is a small piece of data that is sent from a website and stored in the user’s browser. Those stored cookies can be used by advertisers to gauge interest in a product. For instance: a travel agency may want to advertise to you if your cookie history indicates that you have been visiting travel-related websites. As technologies evolve, though, so does the NAI. Government regulation can benefit consumers in many industries, but with digital advertising technology moving so quickly, the snail’s pace of Congress just isn’t a good fit. That is why the NAI was formed in 2000, so industry leaders could combine their efforts and talents to solve the problem with collaboration, not legislation. Being able to quickly adapt to a constantly changing landscape, whether it be nationally or globally, has set up the NAI for success in the future, no matter what it holds. Ten years ago, smartphones were in their infancy and had not yet become an effective tool for spending time online. Now, it’s hard to imagine not being able to browse the internet from a mobile device. The NAI has been adapting to these changing technologies from the beginning and makes sure that its policies keep up with innovation. Its code is amended as new methods of advertising become more prominent. The NAI has also recently put out a detailed code devoted solely to mobile devices and even has a group looking into smart TVs and how to address them in the future. 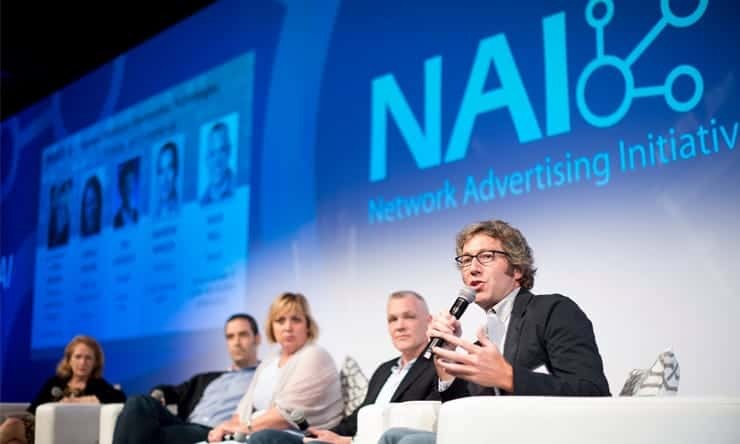 The NAI is part of the Coalition for Better Ads, which is aimed at improving the consumer’s ad experience worldwide. The NAI is even part of a global initiative called the Coalition for Better Ads, which is aimed at improving every consumer’s experience with online ads. The NAI, along with companies around the world, is helping to set up standards that can be applied to the entire internet. The NAI’s sophisticated monitoring arm is able to run audits on all of its member businesses throughout the year. The results of these checks are released in the NAI’s annual compliance report, detailing what was found and how each company responded. “We have amazing response times from our companies in terms of correcting small issues that could become big issues later,” Leigh said. The NAI makes sure that each company knows about its process from the beginning, so there are no surprises down the line. While seeing an ad for a dating site isn’t unexpected, certain types of advertising cause consumers anxiety, and the NAI works quickly to amend that. A recent example was its response to consumer concern about sensitive health information. The NAI updated its code to make the requirements for the collection of that data stricter. The code directs companies to obtain a consumer’s opt-in consent before using any of that information, which is higher than the industry standard. Opt-in consent means consumers have to explicitly tell a company it can use their data. The NAI and its members are constantly looking for ways to improve the digital advertising experience for consumers. That change is in line with the NAI’s mission to educate consumers about the data collected for digital advertising. When industry leaders and consumers are both on the same page, the NAI believes that everyone benefits. So next time an ad pops up for a dating site that you searched for earlier in the day, know that the NAI is working to make sure the data for that ad was collected responsibly. With consumers and advertisers on common ground, the internet can be kept free and beneficial to all.